I am so pleased that our MMMmonday guest blogger is also offering her book, The Christian Mama's Guide to Having a Baby: Everything You Need to Know to Survive (and Love) Your Pregnancy as a giveaway for one of my readers! Erin MacPherson is the author of "The Christian Mama's Guide to Having a Baby" and is the mom to 5-year-old Josiah, 3-year-old Kate and is 38 weeks pregnant with baby #3. She blogs at www.christianmamasguide.com. 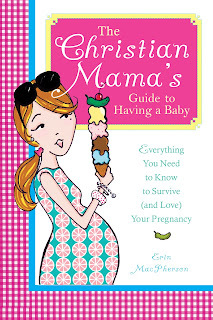 Visit Christian Mama's Guide and tell me something you learned.